The sweetness of a romance, the exhilaration of new marriage. Hard to compete with? Quite the challenge. We met the challenge. 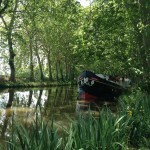 We were married in 2001 and spent part of our honeymoon on a self- drive barge on the Canal du Midi in France. It was now 2014 – and we were celebrating our 70th birthdays again on the Canal. This time we chose to cruise on a hotel barge – more upscale, more luxurious, more decadent? Why not! We were not disappointed to say the least. 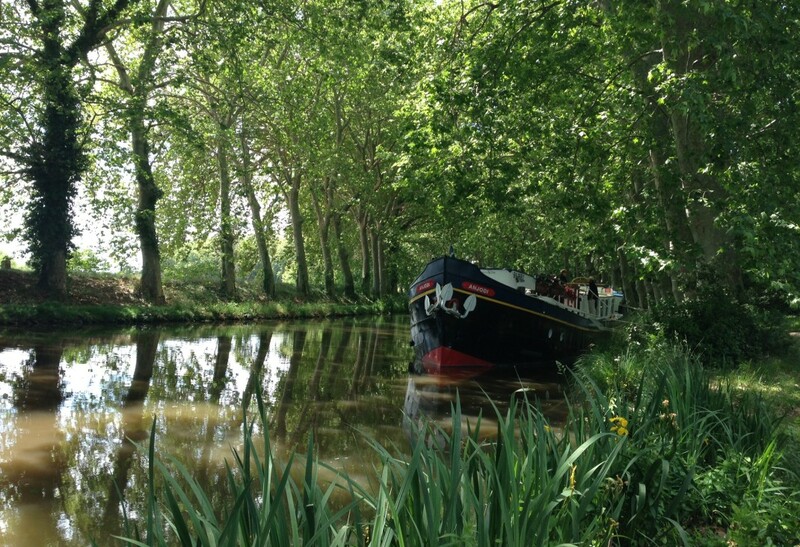 The Canal du Midi in the Languedoc region in the south of France is one of her most scenic canals. Lined with plane trees and passing through acres of vineyards and quaint hamlets the Canal is a favorite of European and American vacationers. Begun in 1666 and covering 150 miles, it took 12 years and 12,000 men to complete. Quite the project without power equipment. The canal itself has changed little since its completion – the lock gates of the 63 locks are now steel rather than timber, but the fisherman lining the banks still shout “pleasantries” as a barge glides by. In 1996 the Canal was declared a World Heritage site by UNESCO. The Anjodi is known as the most beautiful barge on the Canal. Built in 1927 as a freight barge carrying grain between Amsterdam and Paris, she was converted to a hotel barge in 1983. She is quaint and extremely comfortable. With a capacity of up to 8 passengers she has 4 staterooms, all with en suite, facilities. All of the cabins were basically the same in design. 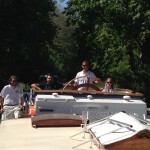 We had a crew of 4, a captain, tour guide/deckhand, chef and housekeeper. Our stateside friends, knowing our style of independent travel, were inquisitive about traveling face to face for a week with strangers. This was very different than being just the two of us on the self-drive. Beforehand, we had our own anxious moments as well. No problem. Although originally from four different countries, we all spoke English, didn’t go too deeply into politics and enjoyed each other’s life stories. Anjodi offered lots of places to just kick back and read or listen to our Ipods. A wonderfully appointed main salon with large couches, a large topside deck with lounge chairs and even a hot tub provided opportunities for alone-time. We had already experienced the fortified walled city of Carcassonne, ancient Narbonne and many of the wineries along the route on our previous holidays – but on this fabulous hotel barge voyage orchestrated by European Waterways it was like experiencing them for the first time. Revisiting the ancient cities and seeing them through the eyes and knowledge of an experienced guide was refreshing. As a bit of a crusty old “been there-done that” traveler, I actually was quite surprised. Seeing the ramparts and towers from different angles and slowing down to enjoy an espresso set the visit apart from our previous whirlwind time in Carcassonne on our own. I now know that this perfectly restored medieval fortified city hosts the longest city wall in Europe and that the oldest sections were built by the Romans in the first century AD. On our previous visit to Narbonne we knew very little of the city’s Jewish community and history. A walk through the tree lined quarter, with the added knowledge was a peaceful interlude. We visited the Cathedral St.-Just, although never completed (cities change and cathedrals take a long time to build) it is the tallest cathedral in Southern France. Most impressive were the beautiful stained glass windows that appeared to reach the heavens. An added treat was time to spend in the enclosed Baltard style city market hall. Each stall had fish and produce and rosemary so artistically arranged that we felt a bit guilty buying some morsels that threw off the picture perfect arrangements – (Just kidding). Mathew had a long shopping list that the Anjodi’s chef had very specifically created for the evening’s fish extravaganza. We could tell that we were close to the Mediterranean. 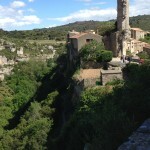 The following day, a most impressive winding road took us to Minerve the ancient capital of Minervois. Its hill-top location makes it the quintessential medieval village at the junction of the Cesse and Briant Rivers with deep limestone gorges. The impressive rocky outcroppings show dramatic uplifting of the earth and in the local museum were ample displays of fossils showing the sea’s presence eons ago. 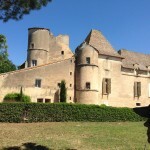 In Minerve and also at Carcassonne, we learned a great deal of the Cathars. In the Languedoc, famous at the time for its high culture, tolerance and liberalism, the Cathar religion took root and gained more and more adherents during the twelfth century. From the beginning of his reign, Pope Innocent III attempted to use diplomacy to end Catharism. But in 1208 Innocent’s papal legate Pierre de Castelnau was murdered while returning to Rome after preaching the Catholic faith in southern France. Pope Innocent III declared Pierre de Castelnau a martyr and launched the Albigensian Crusade. The remains of a Cathar fort besieged by Simon de Montfort in 1210 is a striking example of those bloodthirsty times. Another gem of a town was Pezenas, the seat of the local government for Languedoc during the sixteenth and seventeenth centuries. It is a state historic monument with “hotels particuliers” – period mansions – with wrought iron balconies, stone sculptures and ornate doorways. We had heard of Pezenas as the town where the French playwright Moliere is reputed to have created some of his famous characters. Pezenas was a lovely town to stroll through, admire fine craft work and enter some of the charming courtyards. Mathew brought us a sampling of “petit pate de Pezenas” a specialty that was purportedly brought to Pezenas by Lord Clive of India in 1768. All of the town’s bakers continue to produce this famous delicacy. 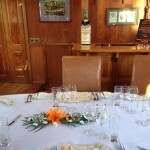 Speaking of delicacies – meals on board Anjodi were truly memorable. Our chef Tony was English with Iraqi descent. His dishes blended the best of innovative French cuisine with an addition of international flavorings. For example, Wednesday lunch was slow cooked spiced leg of lamb, rice salad with raisins and sweet onions, tomato and rocket salad with cucumber and mint yoghurt. A Tuesday dinner started with prawns with basil, fennel and orange salad – followed by supreme of guinea fowl, stuffed leg, mushrooms and celeriac. Dessert was crepes Suzette. On Monday a truly outrageous dessert was Armagnac bavarois with prune and earl grey syrup. I’ve never had a syrup flavored by tea – none of the other diners had either. 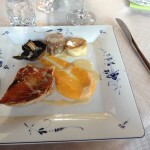 Being in France – of course each meal had a pre-desert offering of cheeses. Always present was a non cow’s milk cheese for those of us who – lamentably – are lactose intolerant. For example a buche de chevre. Some of the exquisite cow’s milk cheeses were Tomme de E’Tang, Langres, Tommette and Ossau Iraty. One of our fellow barge-mates required gluten free bread and other starches and the crew were impeccable in finding just what he needed. Impressive! Non-sugar desserts were also prepared by our chef for one diabetic passenger. Dietary needs, likes and dislikes, were always met with graceful and delicious solutions. Wines, both red and white, were served at each meal with an introduction by our hostess Emily. I developed a taste for Picpoul, a delicious white wine grown in the Languedoc. Some fine reds were a 2011 St Nicolas de Bourgiel and the 2009 Domaine de Perdiquier pinot noir. As wine tasting is always an important part of any visit to France, we had a private wine tasting at the winery of this excellent pinot noir. The setting of the 14th century Chateau de Perdiguier was picture perfect with acres of vineyards and a dozen or so race horses thrown in for added atmosphere. One evening, while the Anjodi was docked in Beziers we had dinner at a superb restaurant, the Ambassade. Tuxedo clad waiters guided us through a meal of gazpacho, trout, veal, and sandre, all beautifully presented with choices at each course and sauces and vegetables too numerous to remember. The cheese cart was more than a yard long and that was followed by a pre-desert and then a photographable (yes- Iphones were out and clicking) chocolate and banana round creation or Languedoc lemon mouse – layered sorbet fantasy. We glided along – day after day – through changing landscapes and blossoming river-side flowers. The colors varied with the time of day and the cloud formations – but the “sounds” of silence were constant. After one week – I wanted more. The end of the voyage was unique in that we left the tree lined canal and cruised through the nature reserve of Bagnas and the inland saltwater lake Etang de Thau, on the way to the lakeside fishing village of Marseillan. We could smell the Mediterranean, only kilometers away, and spotted several flamingos in the distance. Can I call this adventure a second honeymoon? Why not! A wise man once said that to not compare is a sure way to happiness. We were in the moment – the moments were beautiful, we were happy. For more photos of the week on Anjodi click here. 1. The weather in the south of France is generally warm. June, July and August are usually the warmest months with temperatures in the 80’s. During our voyage in May – a light sweater was sufficient. During spring and autumn a lightweight raincoat is a good idea. 2. The rapid TGV train from Paris is an easy way to get to the Languedoc region and is highly recommended. All logistics are expertly handled by European Waterways. 3. WiFi was available on board and on most days signals were strong. Of course, at times, the barge travels through remote areas and the signal varied. 4. The difference between a barge and a river boat is that river boats accommodate 60-250 passengers and navigate the larger waterways of Europe. A hotel barge like the Anjodi take up to 8 passengers – 6 in our case – and can navigate the smaller waterways and canals. 5. For passengers used to exercise daily, the tow paths along the canal are inviting for walking or bicycling. Bikes are provided for each passenger and passengers can get on or off the barge whenever they would like.